A shoot-'em-up platformer with auto-aim, so you can focus entirely on adept evasive maneuvers. 2D shooters that put a premium on twitch reflexes and industrial techno tunes. Once you've seen Equilibrium, the 2002 sci-fi action flick starring Christian Bale, you can never forget the impossibly cool, ludicrously impractical art of gun kata. For those who have yet to enjoy this Matrix-era guilty pleasure, gun kata is a made-up martial art that's a bit like a bullet-firing ballet, in which our hero gracefully swings around twin pistols to mow down rooms full of armed guards (while somehow dodging all incoming fire). And the spirit of gun kata's dual-wielding firefights is a large part of what makes Seraph so enthralling - because no matter where your enemies are in this 2.5D platformer, you're sure to be shooting them up in style. Like Equilibrium, Seraph takes place in a futuristic sci-fi dystopia, revolving around lore that's maybe a bit convoluted, but endearingly confident in its tone. You play as Seraph herself, an angel trapped in the body of a woman who emerges from captivity to a facility overrun by milky-skinned demons. From there, you do the only thing you know how: fill those demons full of lead using your dual pistols and any weapons you find in the environment, then smite their bodies from existence with your angelic powers. Seraph's main mechanical hook is that you don't have to worry about aiming whatsoever. As long as you're in the general vicinity of one or more enemies, Seraph will automatically target her attackers no matter their orientation. In other words, whenever you're being flanked by demons (an extremely common occurrence in the enemy-filled levels), Seraph will fire her pistols in cinematic John Woo fashion, both arms extended as she unloads clips in every direction. Because you're not burdened by a need to actually aim your gunfire, all of your mental energy and fast fingerwork goes towards keeping Seraph alive. Standing still is a death sentence, with enemies constantly swarming you with a variety of cleverly choreographed attacks, so you need to constantly stay on the move. Fortunately, Seraph is incredibly agile, able to slide on and vault off of walls, double jump, and perform slick-looking air dashes that make moving around a breeze. Once you've acclimated to the controls - which is fairly simple to do - you'll be pulling off some dramatic acrobatics without ever tying your fingers into knots. Leaping into a mid-air cartwheel as you pop the two demons skittering below you, dashing through an incoming fireball, then gunning down the monstrosity that threw it at you is as impressive as it is intuitive. It also makes exploring the procedurally generated levels a breeze as you hunt for hidden pick-ups and more powerful weaponry. Now, I typically scoff at the use of procedurally generated levels, because they usually come with some roguelike baggage that feels like the latest fad in game design for a post-Spelunky world. But Seraph uses them smartly, and this most definitely isn't a roguelike: checkpoints make it so that your progress and upgrades don't reset upon death, each level is part of a continuous narrative, and (like the excellent Rogue Legacy) there's a huge variety of stats and abilities to incrementally upgrade as you shoot your way towards the finale. Seraph also borrows a page from the amazing Risk of Rain, in that a clearly visible difficulty indicator scales with your play, ensuring that the challenge always feels just right. 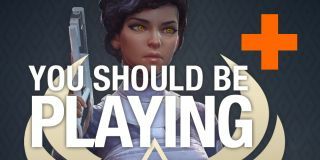 Seraph is one of those rare indie games where watching a few seconds of intense gameplay is all it takes to know if its sleek brand of shoot-'em-all action is your bag. On top of the dexterity-driven movement mechanics and flashy gunplay, Seraph's freakish enemy designs and thumping techno soundtrack only add to the cool factor, and the procedural level generation ups the replay value without ever forcing you to start all over from scratch. Doom may be the best 'obliterate every demon that moves' shooter of 2016, but I'd say Seraph is a not-terribly-distant second.